Special promotions available on this sailing! Promotions may include 2-for-1 All-Inclusive Cruise Fares, Additional Savings, Special Kid Fares and More! 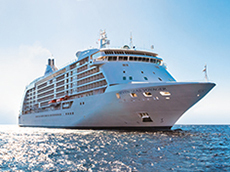 2 for 1 All-Inclusive cruise fares are calculated off brochure fares and are reflected in the rates shown on the Pricing and Staterooms tab. This centuries old capital guards the slender waterway between the Mediterranean and the Black Sea, and is the doorway between the East and West. Visitors can explore remnants of Byzantine Constantinople in the Sultanahmet district, where you will have the chance to see ancient splendors, such as the Haghia Sophia, the Blue Mosque and Topkapi Palace. At night the city boast a lively nightclub scene and excellent Turkish dining options that may include cultural entertainment and dancing. Istanbul also features splendid shopping malls, boutiques, and hand crafted items can be found all over the city. The birthplace of Sappho, a famous poet in ancient Greece, Lesbos is a charming island of picturesque villages like Agiassos. The Byzantine Monastery of Limonos and its beautiful frescoes are of special interest. Visitors come to Kusadasi for beaches and nearby ruins of Ephesus. The major attraction is the archaeological site of ancient Ephesus, considered to be most important in Turkey. The history of this ancient city dates back to 10th century BC; many remarkable structures seen today are result of an excavation and restoration program. Along a white marble road grooved by ancient chariot wheels, the two-story Library of Celsus presents a striking sight. There are temples, houses of noblemen, and community buildings lining ancient streets. Nestled in the mountainside is a 25,000-seat amphitheater, still used for performances during Festival of Culture and Art. Bible buffs may know Ephesus as inspiration for St. Paul’s Epistle to Ephesians and the site of one of the first seven churches of Asia Minor. Treasures are kept in the Seljuk Archaeological Museum. Among the better-known ancient sites near Kusadasi are ancient Miletus and Dydima. Remains include a well-preserved Roman theater at Miletus and Dydima's sacred temple of Apollo. Rhodes is one of Greece’s favored vacation centers and was an important cultural center with a well-known School of Rhetoric attended by such greats as Cicero and Caesar. Rhodes' most famous attractions originated with the Knights of St. John, who occupied parts of the island from 1310 to 1522 and left a medieval town, dominated by the Palace of the Grand Masters and Knights' Hospital, which houses an Archaeological Museum with interesting exhibits of national archaeological finds. Rhodes has inspired many artists. The Old Town offers shopping opportunities and lively nightlife. At Mount Filerimos a church has been built on the site of an ancient temple. A popular excursion is to the charming village of Lindos. Its premier attraction, the ancient acropolis, stands atop sheer cliffs. Walls of a 13th-century Crusader castle enclose the site. Today, the winding path up to the acropolis is lined by stalls, where locals sell lace tablecloths and souvenirs. Mandraki Harbor's entrance is flanked by stone columns topped by figures of a stag and a hind, the town's heraldic animals. Gythion, in south of Sparta, the port of is a good starting point for exploring the Mani area. There are caves with underground lakes and rivers at Glifada and Alepotripa in the Diros region. Mykonos's many captivating attributes make it one of the most celebrated Greek holiday islands. Its main village is a colorful maze of narrow streets lined with white-washed houses, many with bright blue doors and shutters. As an attractive backdrop, famous windmills are lined up like toy soldiers on the hillside, vestiges of a time when wind power was used to grind grain. Mykonos has churches and chapels scattered about the island; quite a number of them are located right in town. Radiant flowers spill over white-washed walls and shady courtyards. In addition to swimming, sunning, water-skiing and surfing, visitors find endless shopping opportunities. Artists have relied on Mykonos' beautiful setting to inspire them. The most photographed site is the Paraportiani, a cluster of white-washed churches resting below windmills. Mykonos's museums include an Archaeological Museum, which houses relics from the Trojan War, a Folk Art Museum and a Maritime Museum. The best beaches are Aghios Stephanos, Psarou, Kalafatis, Onros, Panormos and Elia. Santorini is everything that has made the Greek islands legendary. The world famous island of Santorini is the southern most island of the Cycladic group in the Aegean Sea, and is located north of Crete. Its population is distributed among thirteen villages and just exceeds nine thousand. The marvelous dry climate and unbroken sunshine create year around conditions which are perfect for observation, photographs and videos under an extraordinary variety of natural lights and colors.